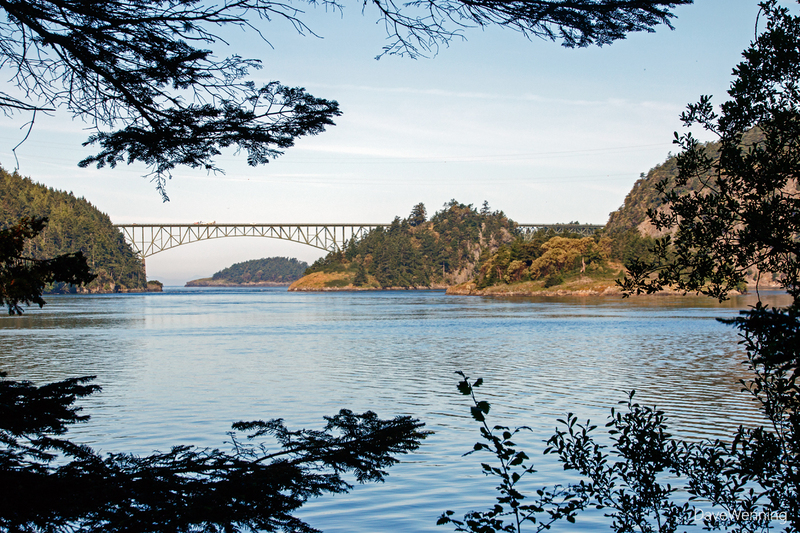 Numbers refer to the Deception Pass trail map legend. Based on the map, the hike would cover about 5.9 miles/9.5 km. When I set off, it was a bit chilly. The Deception Pass Bridge basked in the early morning sun. 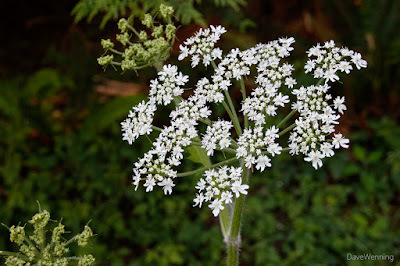 The giant Common Cow Parsnip (Heracleum maximum, H. lanatum) was blooming along Cornet Bay Road. 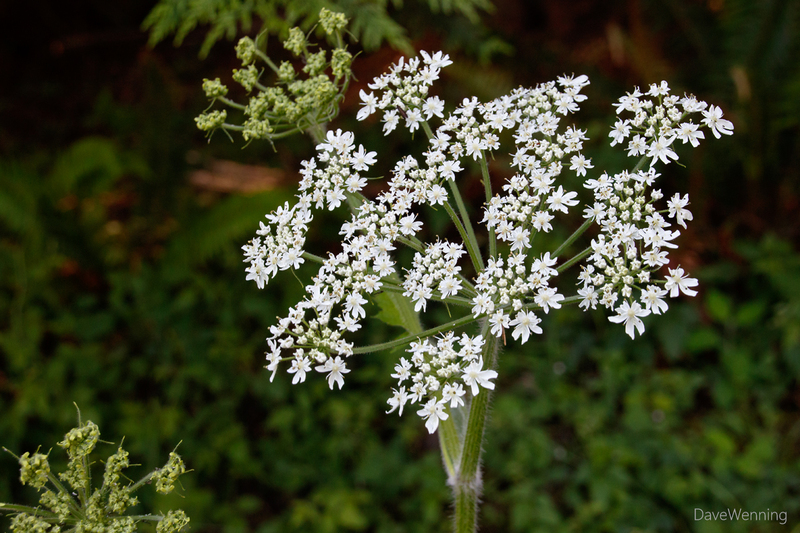 The umbrella-like flowers are called umbels and can be a foot across. 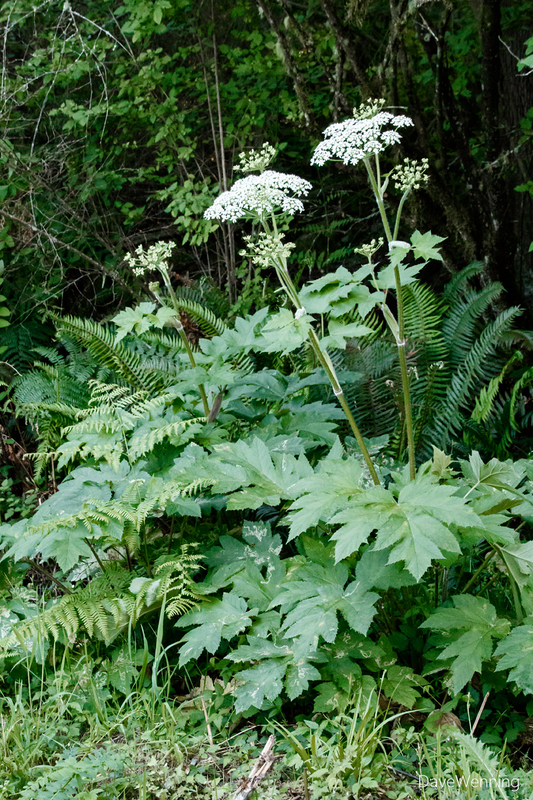 According to the Washington Wildflowers app, the plant is "named for Hercules, son of Zeus, a mortal of extraordinary power and size." 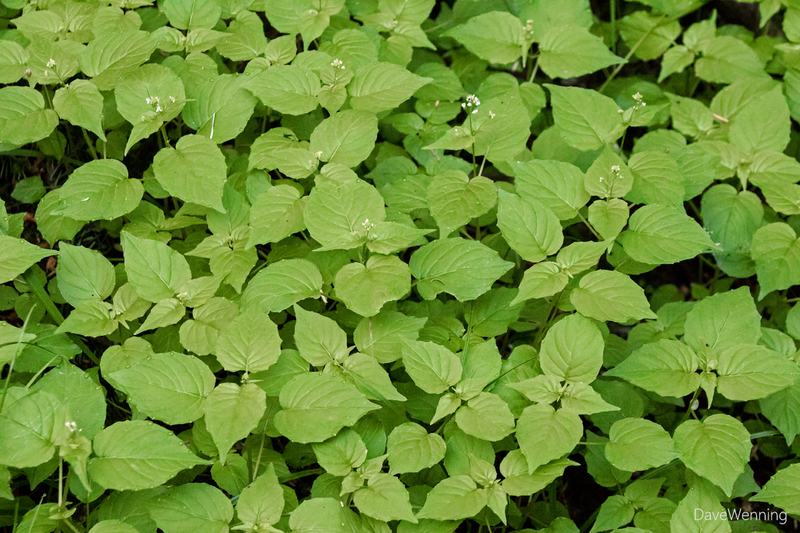 Hikers should avoid brushing up against the plant. It can cause persistent and recurring rashes in sensitive individuals after exposure to sunlight. 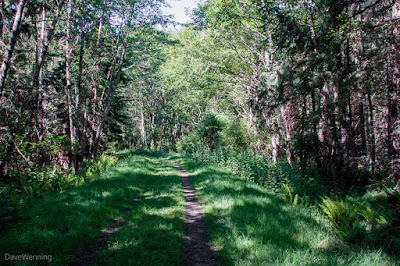 The South Trailhead off Cornet Bay Road links up to the West Hoypus Point Trail. Next to the West Hoypus Point Trail, I found Enchanter's Nightshade (Circaea alpina) from the Evening Primrose family. It is just starting to bloom. 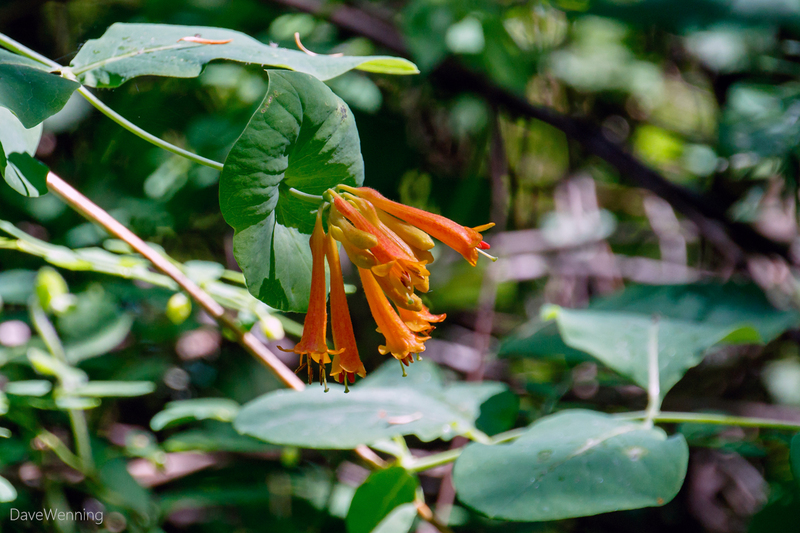 The genus is named for Circe, the enchantress from Homer's Odyssey. Remember, she used potions and herbs to turn Odysseus' crew into pigs. 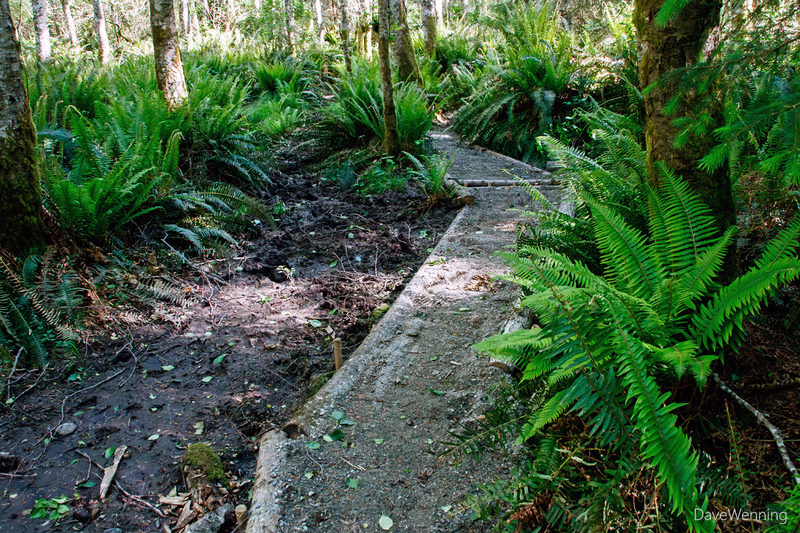 During last winter, I found much of the Little Alder Trail under water. Detours and rickety, makeshift boardwalks helped a little. Since then, Eagle Scout Travis Morgan (.pdf) and his crew came and built elevated walkways of crushed rock making it possible for hikers to pass through with dry feet. Packing in all that gravel must have been a chore. I really appreciated this improvement. The standing water has dried up now, but the wet trail sections are still soft and muddy. 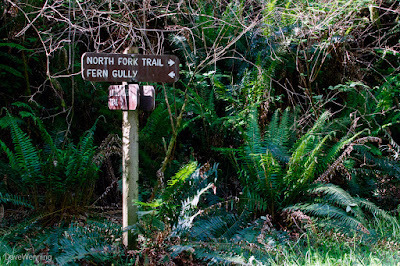 At the end of Little Alder Trail is the junction to Fern Gully (left) and my destination, the North Fork Trail (right). 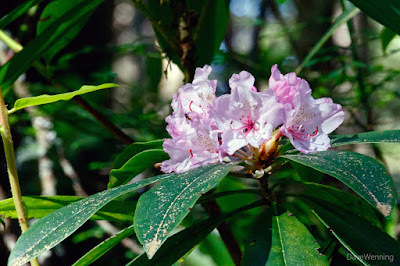 To paraphrase a line from a favorite movie, "Admiral, there be rhododendrons here!" What a surprise it was to discover another native Pacific Rhododendron grove along the North Fork Trail. Those who follow this blog will know this was a special treat for me. 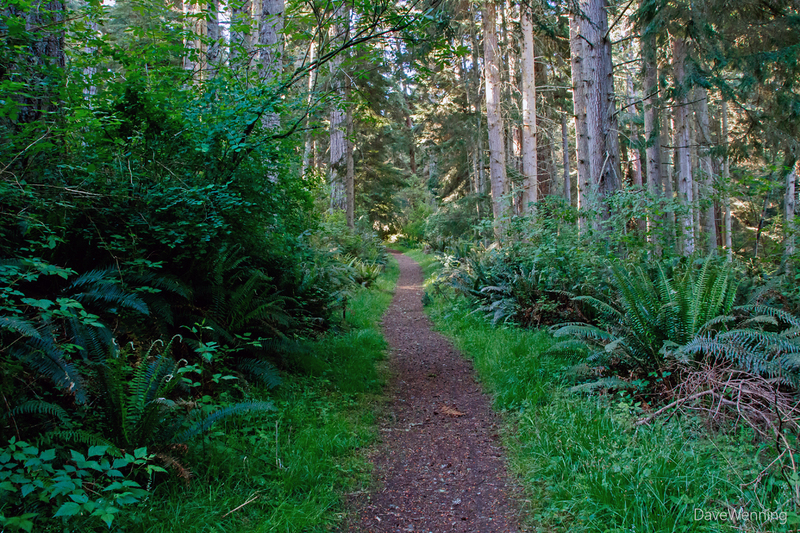 I almost left the North Fork Trail to hike Shady Way (23) which is the only trail I have not yet explored at Deception Pass. 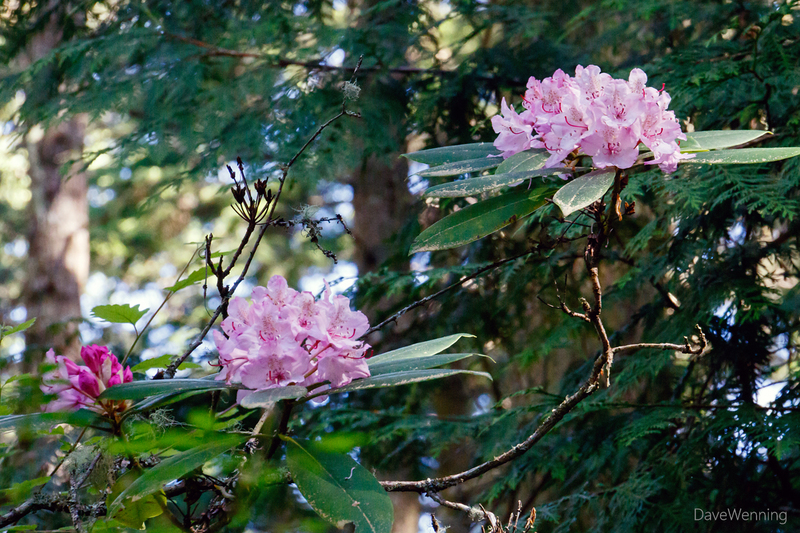 Had I done that, I would have missed these rhododendrons. 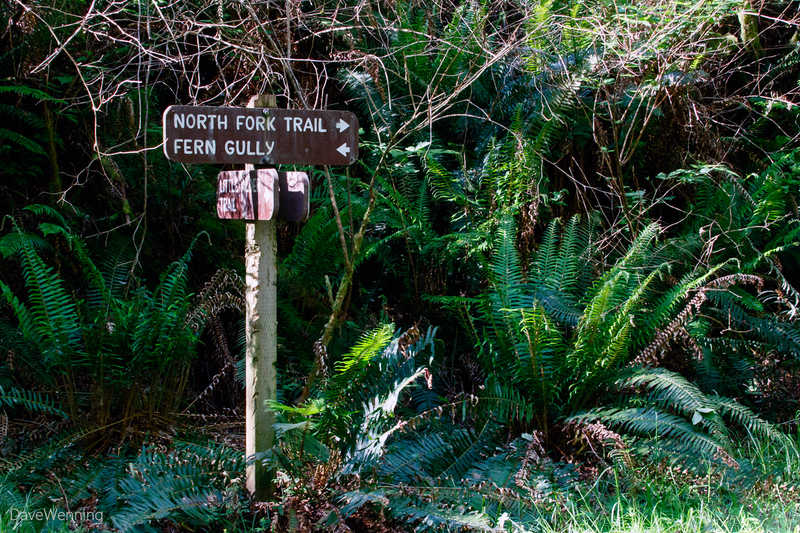 Fortunately, I decided to continue to the end of North Fork. This stand is at least as large as the one at Goose Rock. 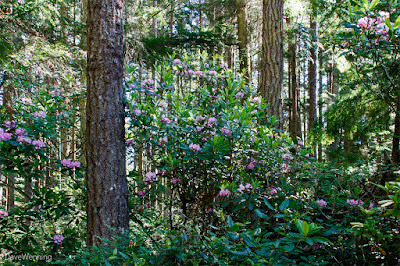 The terrain here is flat and the woods are more open than at Goose Rock making the plants easier to photograph. I caught these rhodies just in time. They are getting near the end of their bloom now. 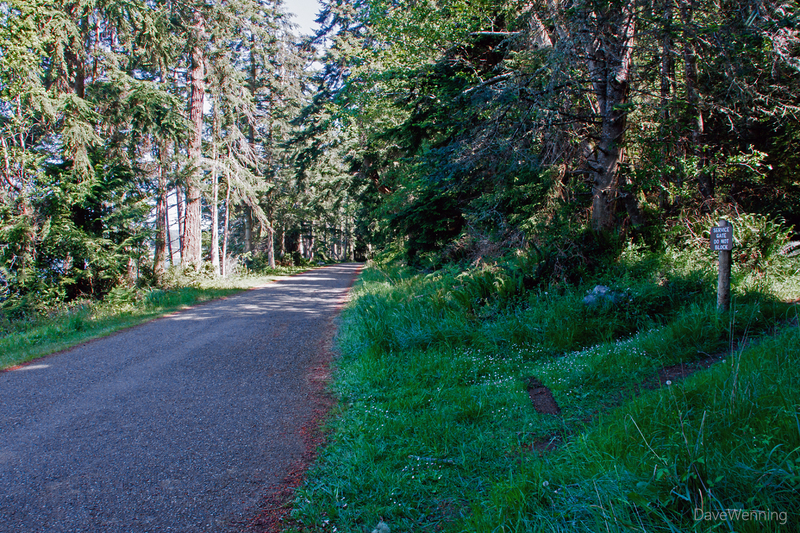 At the end of the North Fork Trail, I pick up the Old Hoypus Hill Logging Road. 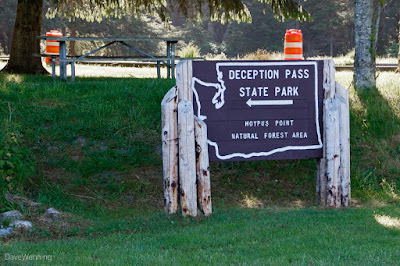 This section of the park was previously Department of Natural Resources land. A sign indicates it was logged in 1984 and replanted with Douglas Fir in 1984 and 1985. 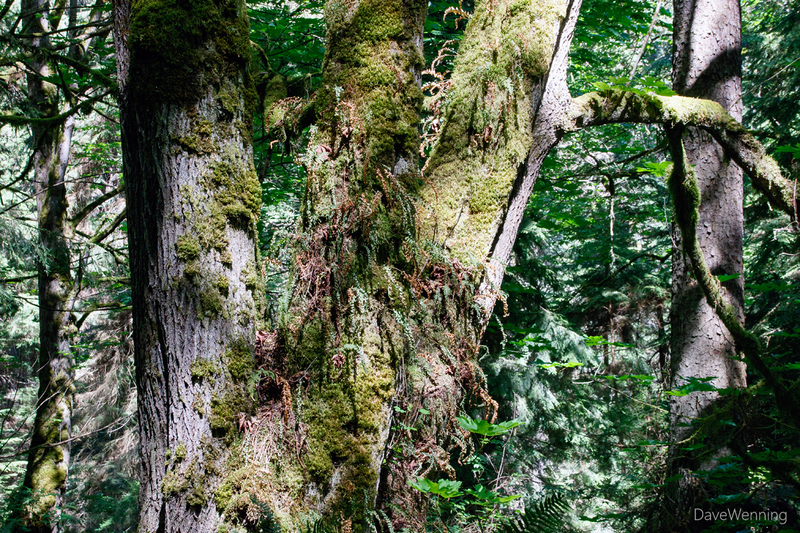 Besides young Douglas Firs, there are a lot of Red Alders revealing an early stage of forest succession. 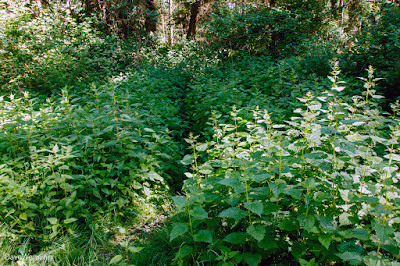 The Alders will grow fast and drop their leaves every season replenishing the soil. 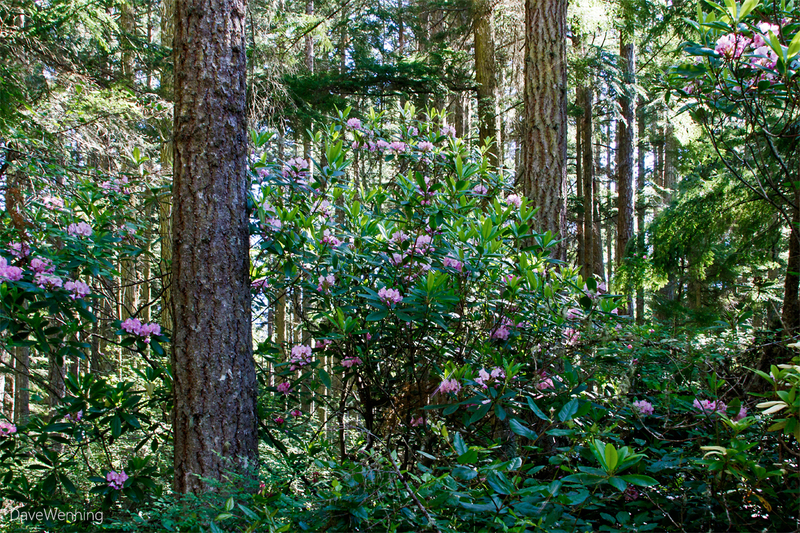 Eventually, they will die off to make room for the Douglas Firs, plus Western Redcedar, Sitka Spruce and Western Hemlocks. Up the road, I found the junction to the Julie Trail. This was the way to the magnificent Fern Gully I wanted to revisit after first seeing it last winter. 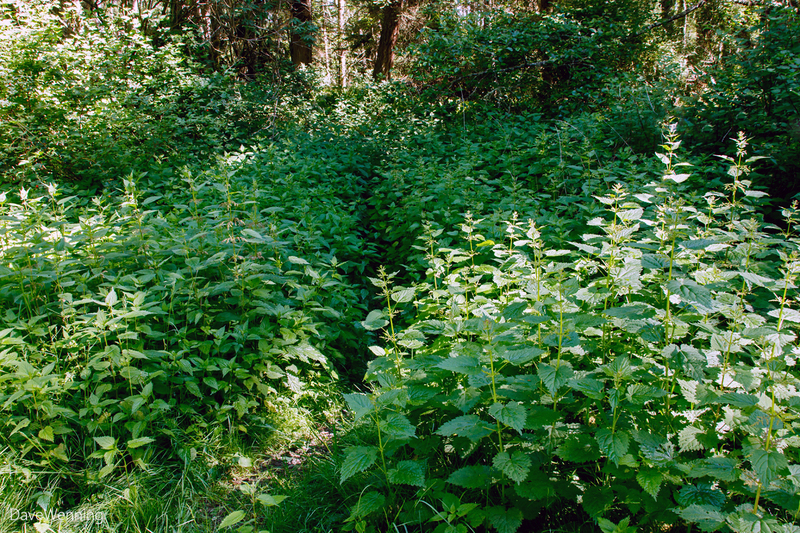 Here, the Julie Trail should be renamed the Stinging Nettle Trail. Fortunately, by holding my arms and camera over my head, I avoided getting stung. At Fern Gully, the summer-like lighting is a lot different now, but it is still awesome. 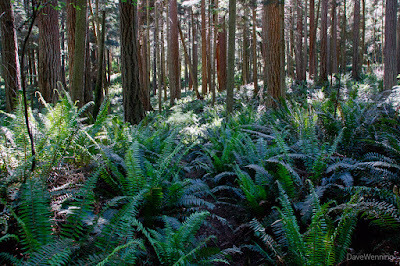 In every direction, as far as the eye can see, the forest floor is carpeted with shoulder-height Western Sword Ferns (Polystichum munitum). Continuing along Hemlock Hideaway, I picked up the East Hoypus Point Trail at its origin. Orange Honeysuckle (Lonicera ciliosa) was blooming in sunny spots next to the trail. 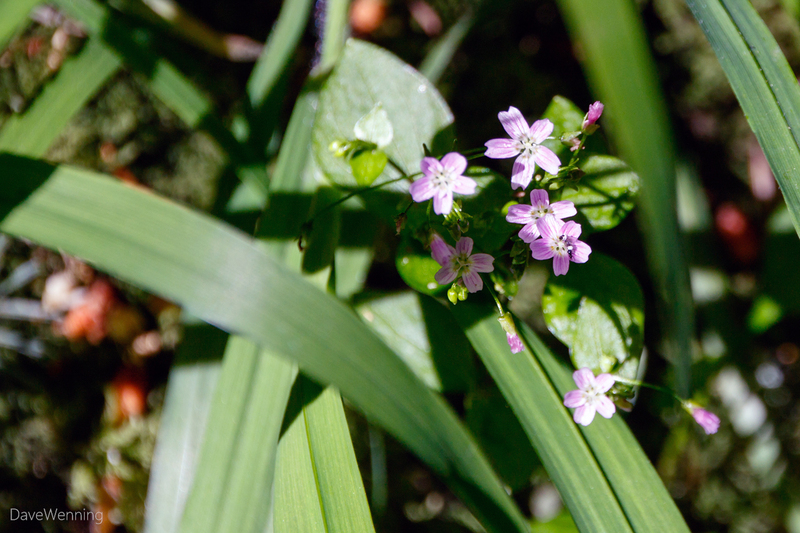 Another common trailside wildflower is Siberian Springbeauty (Claytonia sibirica, Montia sibirica). 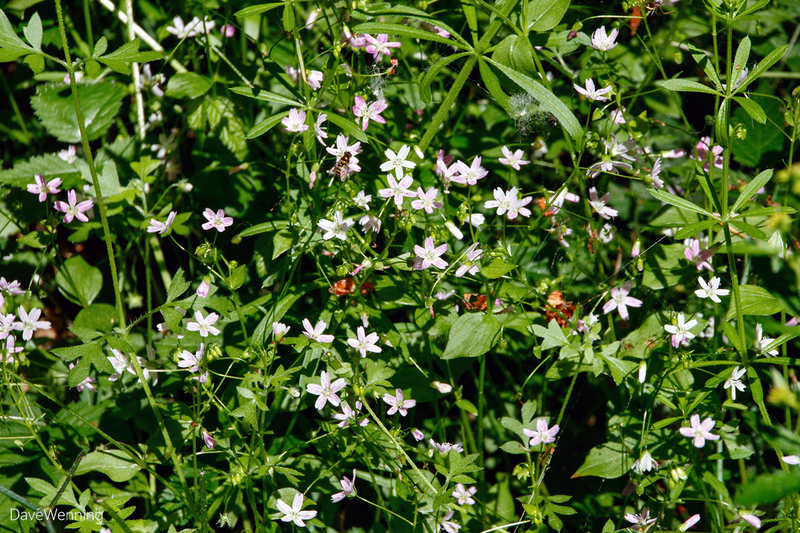 It's also called Candy Flower and Siberian Miner's Lettuce. On the East Hoypus Trail, I stopped to pay my respects to Grandfather Douglas. This Douglas Fir (Pseudotsuga menziesii) is 7 or 8 feet (2-2.5 meters) in diameter at the base. 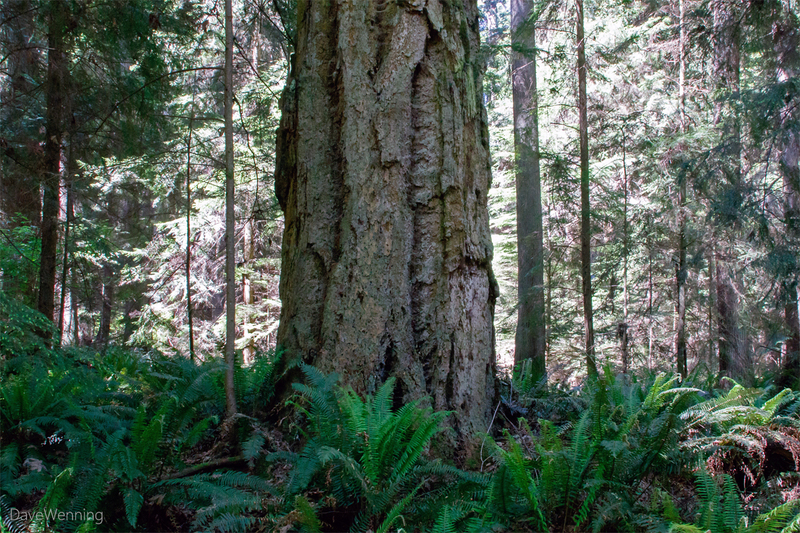 It is difficult to portray in a photo how massive an organism this is. Its top was hidden by the overstory. Standing near it, you feel the presence of an important life form. Last winter, I posted some photos of the Bigleaf Maples (Acer macrophyllum) growing along the East Hoypus Trail. 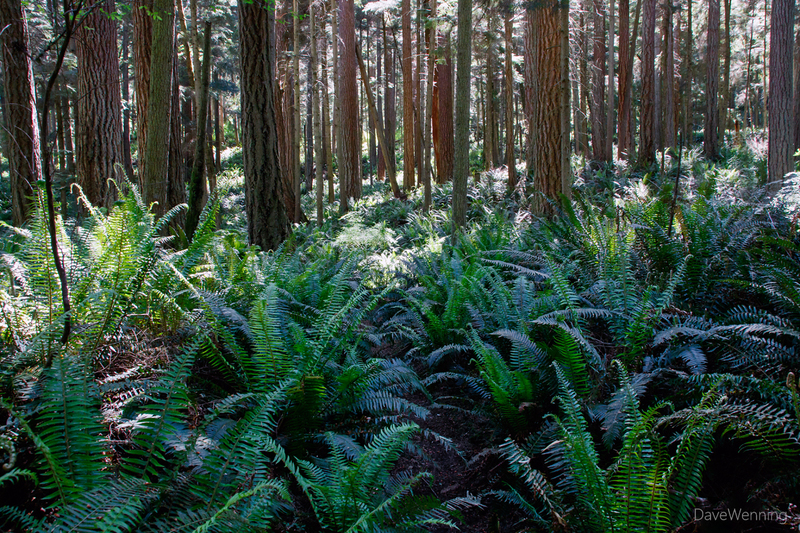 Now their moss and Licorice Fern companions are drying up and going dormant for the summer. Don't worry, they'll be back in all their glory again next winter. 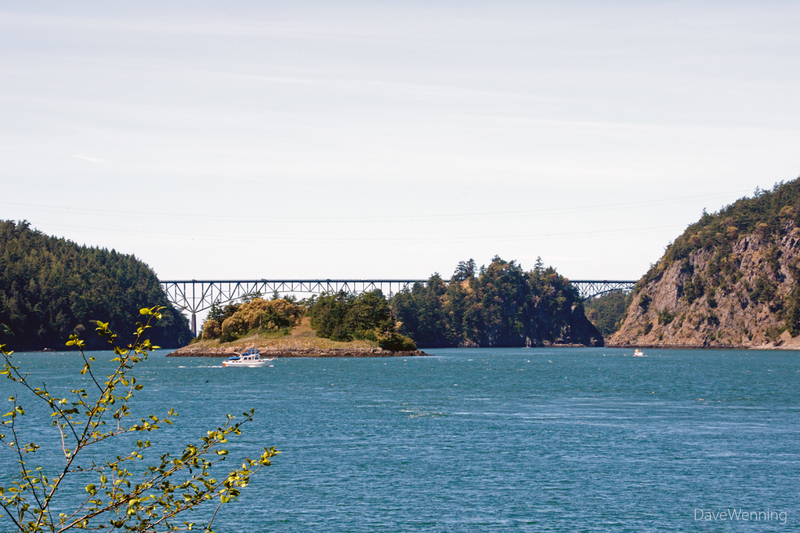 Back on Cornet Bay Road, I caught another glimpse of the Deception Pass Bridge, this time in midday light. I have one more trail to go, Shady Way (23) here at Hoypus Point. Then I will have hiked every one in Deception Pass State Park... At least until they open the John Tursi Trail (.pdf) on June 4, 2016.